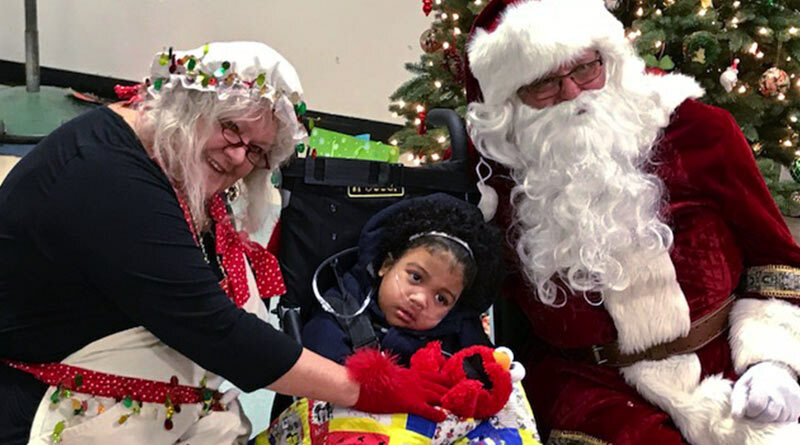 Continuing a tradition that has gone on for decades, union members visited disabled kids at the Starr-King Elementary School the week before Christmas to deliver gifts and good cheer. The annual event at the Ralph Richardson Center at the Carmichael campus that serves children with special needs is one of the highlights of the holiday season both for the dozens of union members — including firefighters who drive Santa to the school in their engine — and the kids and teachers of the school. Sheet Metal Workers 104’s Randy Young once again pulled on his baggy red pants, stuffed a pillow over his belly, and headed out for his gig as the union Santa – delivering gifts and good will students. Young is always joined by Patty Paterson of IBEW Local 340, who plays Mrs. Claus. The pair gets a lift from the firefighters in Station 110 on Eastern Avenue, members of Local 522, who deliver the duo in a ladder truck. Unions including Sheet Metal Workers’ Local 104, CSEA, Local 127 and classified workers at the Ralph Richardson Center also support the event. The children’s fun-filled day included a visit with Santa and a special gift for each child. 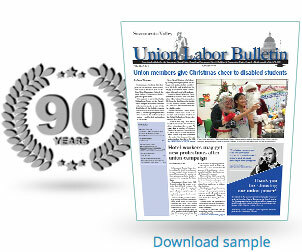 This tradition has become one of the Labor Council’s favorites, said Greg Larkins, AFL-CIO community services liaison for the United Way, who is the main organizer. “To be able to see the joy of the holiday season through these children’s eyes is magical. There isn’t a dry eye in the house,” said Larkins. While unions’ leadership on community events like this one is especially prominent during the holiday season, union activities like this happen all year long, said Larkins. He pointed out that a core part of the mission of labor unions is to build stronger communities through service whether it’s honoring veterans, serving food to the homeless, providing scholarships to youth or giving folks opportunities to create a better life for themselves and their families through a union job.